Cute Robots Rock Button Badge in a light blue with a retro robot design holding a cute guitar and with a large red love heart on his chest. Also has the text Robots Rock beneath it in a black and white text. 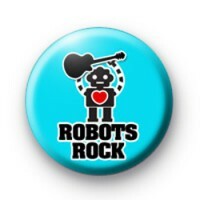 A really cute badge for those of you who love Robots & a bit of a play on words as our robot is playing the guitar, so he really does rock. These badges are perfect for schools & teachers who are teaching electronics & robotics and are popular with our science fiction lovers. We have a great range of robot badges which are super popular with schools & colleges so be sure to have a browse or use the search box on every page of our website. Standard 25mm badge made by hand in our workshop.